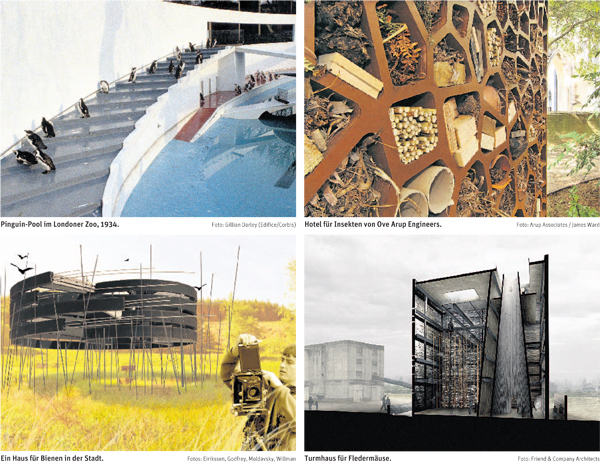 An article covering the Animal Architecture Awards was recently published in the Austrian daily newspaper Der Standard. Translation from German to English was generously provided by Rainer Ponzel and Peter Schaefer. A pdf of the original article can be downloaded here. Enjoy! Building regulations, norms, and technical regulations and not to forget common sense: how to accommodate the species homosapiens in a built environment is very well defined and arranged. But what if humankind builds for other creatures on earth? How would animals like to live? What wall color does a capybara prefer, how much space does a brown bear need? From what height do chamois need a balustrade? Do penguins like concrete? At least the last question seems to be answered in 1934. During that year the London Zoo opened the new penguin pool: a glowing white oval with 2 elegant floating semi circular concrete ramps. The Russian exile architect who built the revolutionary rotating gorilla compound the year before was suddenly able to import modern architecture into the sleepy Great Britain with its country style. The penguins liked the cool modern ambiance and walked as intended up and down the ramp. Protected shaded areas and slate and rubber floors are taking care of the necessary variety. “For the first time animals are not housed in artificial replicas of their natural environment“, cheered former Bauhaus professor Laszlo Moholy-Nagy at the opening of the building. He was right because up to this date animal cages in Europe have been designed in a colonial exotic style. Elephant houses looked like Hindu temples, ostriches lived in Egyptian pyramids. The animals didn’t have much of these eccentric styles. For them the decorated compounds were nothing more than sad display cases. The birds were very lucky because they have always been living very innovative. Todays’ listed aviary of the London Zoo was a technical masterpiece at the opening in 1964, just like the equivalent at the Zoo Hellabrunn in Munich which was designed by Olympic-engineer Frei Otto as an almost invisible prime example of tensile structures. Since then the trend has reversed. The angular concrete compound for polar bears in Munich appeared too cold for most visitors. In 2010 it has been transformed to a polar scenery with artificial ice as backdrop. Worldwide compounds are changing to theme parks with an experience scenery. Just like the insect hotel, star engineer Ove Arup who is normally busy with Olympic stadiums and airports worldwide has built the prototype in 2010. It’s a head-high square of compressed plywood, subdivided like a type case in tiny rooms furnished with preferences of each species like sand, branches and compost for beetles and similar insects. The response to the site was finally so strong that the Animal Architecture Awards were initiated at the beginning of the year. The results of a well-known jury have been published last week. “Our expectations have been exceeded by far, we had submissions from Germany, England and Italy all the way to Singapore”, says Dodington. The winning projects show that the participants obviously had fun: From a 3D-computergame where participants can enter the cognitive world of animals to a gigantic farmland adventure park in the Midwest where bored city dwellers can become eco-farmers for a weekend. The team of the University of Nottingham transformed a factory into a town house for bees, whose population dramatically decreased in the last couple of years. Friend & Co Architects from England translated high-rise concepts from Le Corbusier into small towers for bats, which can’t find a habitat in today’s hermetic sealed houses. 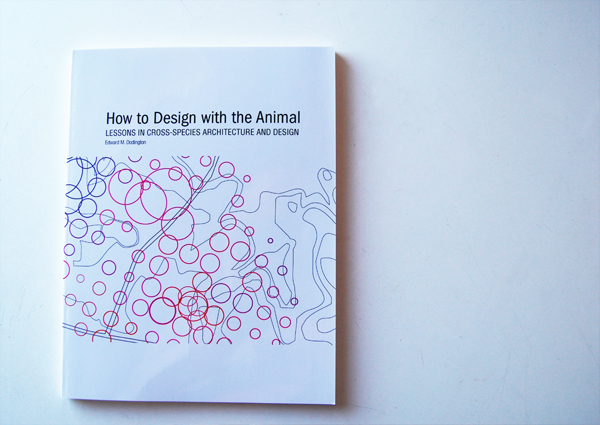 The projects are soon being presented in the Architecture Center Houston and, according to the initiators, there will be a continuation: ”Should the Animal Architecture Awards become a repeating event?” “Definitely!” says Ned Dodington. Whether abstract, funny or playful: it is obvious that human kind has been interfering for too long and too much with the environment of animals to leave it now without any housing up to themselves. Intriguingly, the engineer behind the ramps of the penguin pool was Ove Arup. However, sorry to say that the penguins did not appreciate the innovative use of reinforced concrete. The original London penguin pool has been filled in and is now used by porcupines, who presumably wouldn’t know a piece of modernist architecture if it happened to get stuck to them.